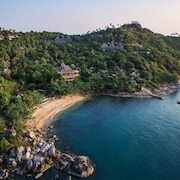 It once took an entire day to trek from one end of Koh Samui,Thailand, to the other through the mountainous jungles in the island's interior. The journey became much quicker after roads were built on this once isolated Gulf of Thailand island in the early 1970s. This was also when tourists first discovered the beautiful beaches and spectacular diving beneath Koh Samui's crystal clear waters. 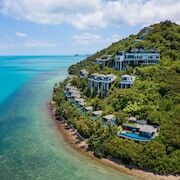 Although Koh Samui now ranks second to Phuket on the list of southern Thailand's most popular island beach retreats, much of the island's initial charm and tranquillity remain intact. Chaweng and Lamai have long been Koh Samui's biggest and busiest beaches, but the island is also filled with smaller and more peaceful alternatives. Mae Nam is a favourite with young families because of its shallow waters, while the laid back fishing village of Bophut is the departure point for several scuba diving tours. Big Buddha and Choengmon are two lovely northeast Koh Samui beaches, but the south coast contains some of the island's most secluded beaches. Two of Koh Samui's most impressive waterfalls are Na Mueang, surrounded by several purple rocks, and Hin Lat, which features basins large enough for comfortable swimming. 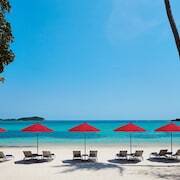 Thong Takhian and Laem Set are Koh Samui's most outstanding coral beds. The Wat Phra Yai temple is most famous for its 15m Buddha statue, but Koh Samui's most unusual natural landmarks may be Lamai Beach's Grandmother and Grandfather Rocks. Chaweng, Lamai, and Nathon contain the majority of Koh Samui restaurants and bars. Seafood is a popular menu item, but demand sometimes exceeds supply during high season. Indian, Malaysian, and Indonesian influences are all evident in many local dishes. Bophut's candle-lit watering holes provide more romantic alternatives to Chaweng's livelier beer bars and nightclubs. 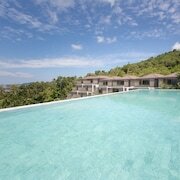 A rum distillery is located on Koh Samui's south coast. For Koh Samui shopping, Nathon is known for cheap prices, Chaweng contains the most choices, and Lamai features some of the island's most unusual shops. Chaweng's three-floor Central Festival Samui is the island's biggest shopping complex. Lamai Night Plaza is sometimes compared to Bangkok's Patpong night market. Weekly walking street shopping events also take place in Chaweng, Maenam, and Bophut's Fisherman's Village.